I love my pillow it is the only pillow i need, when my grandson come to visit he always want my pillow, would be nice to have for every bed. I recommend them to everyone. Get the restful rejuvenating sleep you deserve when you add this state-of-the-art memory foam pillow from Authentic Comfort to your bed. Crafted from polyurethane foam and covered with a soft polyester cover, this pillow boasts a ventilated design that reduces pressure points and cradles the body for an incredibly comfortable sleeping experience. The memory foam resists dust mites and is antimicrobial for easy care. I have purchased these pillows by this manufacturer before. These particular pillows are a bit softer than I think they should be. The foam is good but the firmness is not. Sizing is excellent on a Queen Bed when you buy the jumbo size. If you want a memory foam pillow that is on the softer side then these pillows will be great for you. If you want a bit more support then I would not recommend these pillows. very comfortable memory foam but soft, not firm. this made my neck actually feel good in the morning. 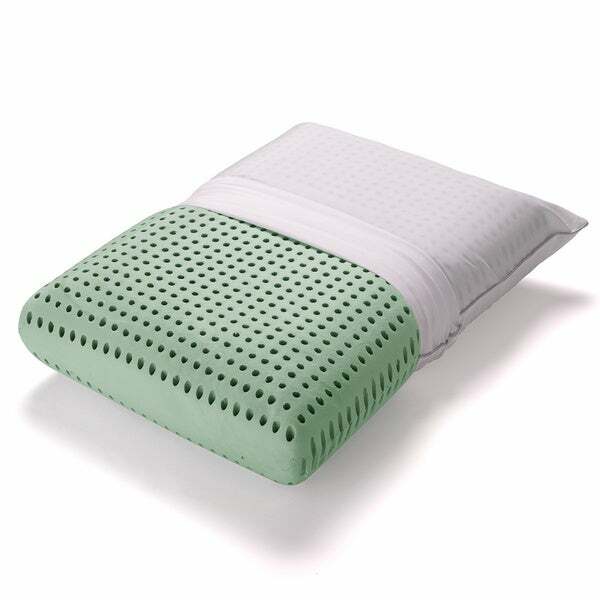 Love this pillow - actually retains shape/support where most memory foam will lose support quickly The Green Tea fragrance is not overwhelming and very slight. Not quite memory foam ! Smells good, nice cover,best for a side sleeper or sitting up in bed,not to firm. If you are looking for a pillow that is soft and suish-able look further. These pillows really do hold up and are a good value but my husband and I are not finding them comfortable. I think this is more due to taste than the actual product. If you are looking for a firm pillow that has no give this is for you. The pillow smells awesome, the scent is refreshing and helps me fall asleep. The memory foam is firm enough to support my head and yet, soft enough to craddle my face. This is the best pillow I have ever slept on. I used it for the first time last night and I had the best sleep in a long time. If you are looking for a pillow that is not too firm and not too soft, this is it. I am so glad I chose it. I chose the jumbo size and it just fits in a standard pillow case. Thank you Overstock you did it again. This is an excellent pillow for me. It gives enough support for back and side sleeping. It also keeps my neck in a good position, and doesn't make it hurt as many firmer pillows do. The green tea fragrance was noticeable in the beginning, but after a couple of weeks I don't notice it anymore. It's very comfortable, and has ended my search for the perfect pillow. I previously had the standard size of this pillow but am enjoying the jumbo even more. Sleep like a baby with this pillow - highly recommend. I had hoped these pillows would have a bit more "give". They are extremely firm. I prefer not to have my chin embedded in my chest when I sleep. They will be good to use as prop pillows when sitting up and reading but I feel they are too hard to sleep on. I love my new pillow. I have been sleeping better ever since I got it. I was hesitant to buy such an expensive pillow sight unseen, but am so glad I did. It is a wonderful pillow, no more neck cramps, very comfortable. I really am happy with it! This pillow was not what I expected in that it did not function as I had hoped. Gave to my sister as she is a back sleeper whereas I am a side-sleeper. He grandson grabs that pillow when he comes for a visit. Good size very nice firmness for a new pillow. great for anyone, especially if you wear CPAP equipment. Love it. Seems to go flat after awhile. good quality pillow, bought 2 for the guest rooms and no complaints from any of our guests. Bought 2 of these. They also come in a standard, contoured version which I also have. Cannot go wrong with Overstock's return policy!! The green tea scent is great and the pillow is comfortable. My only criticism is that it didn't stay as cool as I had hoped. Although that could be because I'm a pretty hot sleeper. "Is the jumbo size like a queen size or King size? Ty"
I have one and I want another.